Low Calorie Dals, Low Calorie Kadhis, Healthy Dal and Kadhis. People are very health-conscious these days, and keep a constant tab of what they eat. They are especially keen on curbing their everyday intake of high-calorie foods so they can afford to occasionally indulge in their favourite treats. This section opens up the possibility of making delicious dals and kadhis in a low-cal format, using little or no oil. Many of these recipes are also diabetic-friendly. Feel free to indulge in Fatless Maa ki Dal , Palak Kadhi , Rajma and Urad Dal and Suva Chana Dal . Low Calorie Dals, Healthy Dal recipes. We all love maa ki dal and we have transformed this into a healthy fatless ma ki dal recipe made with ZERO oil and low fat curds. This recipe stays away high fat butter. Dal Makhani is probalby the most popular Punjabi Dal known in India. We have removed the ghee and cream and made a tasty low calorie dal makhani recipe. The folic acid in urad dal helps your body to produce and maintain new cells, especially red blood cells. Being rich in Phosphorus it works with Calcium to build our bones, high in fibre and good for heart. See why you should have this low calorie dal makhani recipe with just 100 calories. Suva masoor dal is another Zero oil recipe. Masoor dal is rich in Folate, Vitamin B9 or Folic Acid which helps your body to produce and maintain new cells, especially red blood cells. Only 70 calories for suva masoor dal. Spicy yellow moong dal recipe is our third zero oil healthy dal recipe. Packed with nutrients like zinc (1.4 mg), protein (12.2 mg) and iron (1.95 mg), yellow moong dal helps to maintain the elasticity of your skin and help to keep it moist. See how this recipe has 72 calories in spicy yellow moong dal. Dal Moghlai recipe is made from toovar dal and chana dal with lots of doodhi, tomatoes and onions. Chana dal has high amount of potassium and low amount of sodium which makes it very effective in regulating your blood pressure. See why you should have this 128 calorie dal moghlai recipe. Dahiwala toovar dal recipe is diabetic and heart friendly. Toor dal is rich in proteins, the building block of good health. High in fiber, diabetic and heart friendly. Being an excellent source of folic acid, pregnant women must include toor dal in their daily diet. See why you should have this 117 calories dahiwala toovar dal recipe. You must switch to having healthy dals in your daily meals. We have loads of healthy dal recipes for you to follow. Remember to combine healthy dals with bajra roti, jowar roti, radish nachni roti recipe , basic ragi roti recipe, and whole wheat roti to make a healthy combination. Note that when you combine any dal with any cereal like bajra, jowar, ragi, buckwheat, barley or whole wheat to enhance the protein value. Low Calorie Kadhis, Healthy Kadhi recipes. Gujarati's love their kadhis and add lots of sugar and use full fat milk. We have converted this into a healthy low fat kadhi recipe which is now perfectly fine for weight loss and diabetics with only 77 calories for the healthy kadhi. Sprouts kadhi recipe gives your regular kadhi a nutrient boost by adding sprouts to it. The sprouts not only contribute immense nutrients and fibre but also a variety of textures, which makes the kadhi more toothsome. 108 calories in sprouts kadhi makes it perfect for a healthy lifestyle. Karela kadhi recipe is a super option for diabetics. Made with karela and low fat curds and zero sugar added to it. Many studies have shown that karela contains insulin like substances which help to keep blood sugar under control. The radish koftas in kadhi recipe is a simple combination of radish and low fat curds needs only steamed brown rice to complete your meal. You can adjust the consistency of the kadhi by varying the amount of water and besan. The radish koftas are steamed and not deep fried in the kadhi. It is also a good way to add vegetables in your diet to provide vitamin A and iron. The curd and besan combination makes the kadhi a rich source of protein and calcium too. You must switch to having healthy kadhis in your daily meals. We have loads of healthy kadhi recipes for you to follow. Remember to combine healthy kadhis with bajra roti, jowar roti, radish nachni roti recipe , basic ragi roti recipe, and whole wheat roti to make a healthy combination. Note that when you combine any kadhi with any cereal like bajra, jowar, ragi, buckwheat, barley or whole wheat to enhance the protein value. Don't have your kadhi with rice. That is not good for you. 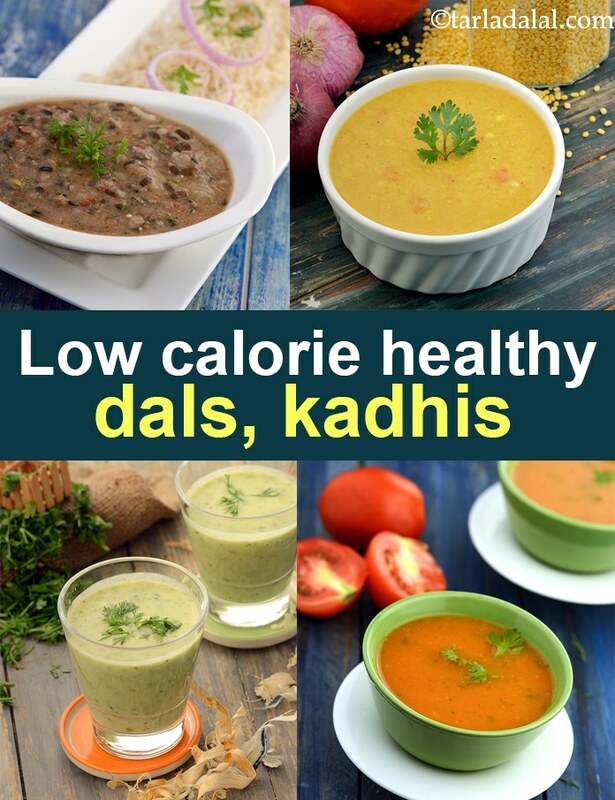 Enjoy our Low Calorie Dals, Low Calorie Kadhis, Healthy Dal and Kadhis and other dal, kadhi recipe articles below.